This is a picture of my DD. I love these rare moments of watching my kids sleep. It's these moments that make not strangling them when they driving up the wall a lot easier...LOL! This was for the Fussy cutting call for the June issue of SNR. The Graphic 45 papers were perfect for this call as was apparent by the number of LO's submitted using these same papers...LOL! Luckily scrapbooking a a unique form of art so no 2 pages were the same and it was interesting to see different approaches using the same papers. I added some of my favourite Prima blooms to make a flower cluster at the bottom left. I also fussy cut some of the fairy images out of the papers and added one to the bloom. Those fairies are just so damn cute. The floral papers gave me a lot to work with. I must admit that it was an exhausting task cutting all the blossoms and branches out but well worth the effort. I added mini pearls to some of the blossom centres. I also added some mini ribbon rose buds which I made using Lisa Gregories tutorial. These are still a favourite of mine. Thanks Lisa. I finished off by adding one of the gorgeous Prima butterflies which co-ordinated perfectly with the PP's. Thanks for taking the time to look and hope you enjoyed the project. If you haven't tried fussy cutting before then I highly reccomend it. 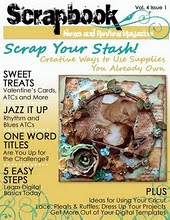 It's a fun and economical way of embellishing your projects. Wow! This caught my eye on my blog list....Your layout is GORGEOUS!